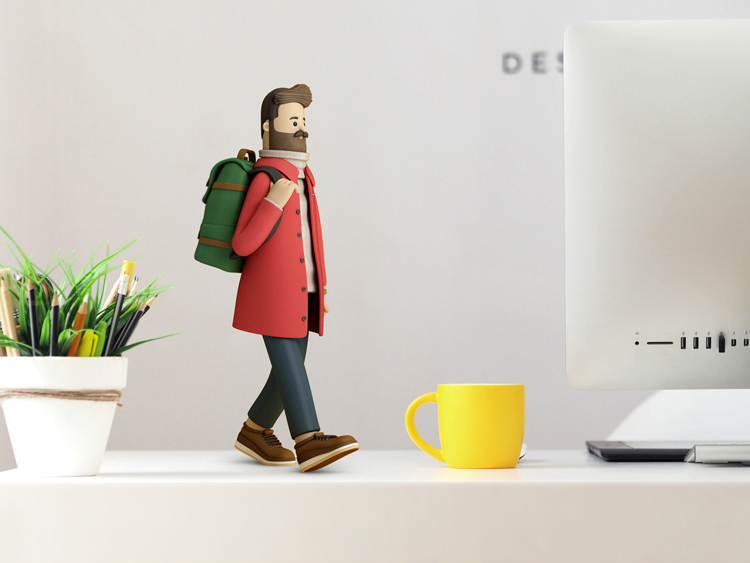 The funeral comparison service has taken on new name Beyond, and design studio SomeOne has given it a new identity centred around a three-dimensional, cartoon man, which looks to counter the “sunsets, flowers and doves” that litter the sector. Studio SomeOne has rebranded funeral price comparison website Funeralbooker, with a “charming” and “radical” identity that aims to stand out from a “sea of sameness” in the funeral sector. Funeralbooker was founded in 2015, with the aim of helping those who are grieving to search online for a funeral director. It offers a similar service to insurance comparison websites Compare the Market and Confused.com. The company lists hundreds of independent funeral directors on its website, providing price comparisons and reviews by customers. 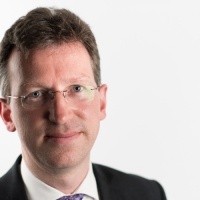 It was set up to counter the dominance of major players in the sector, such as Dignity PLC and Coop Funeralcare, which represent 34% of the market. It also looks to tackle “opaque” company practices around not making pricing transparent, says Ian Strang, CEO at Beyond. The company also provides other services such as assisting people with writing their wills, and settling their assets and estates. 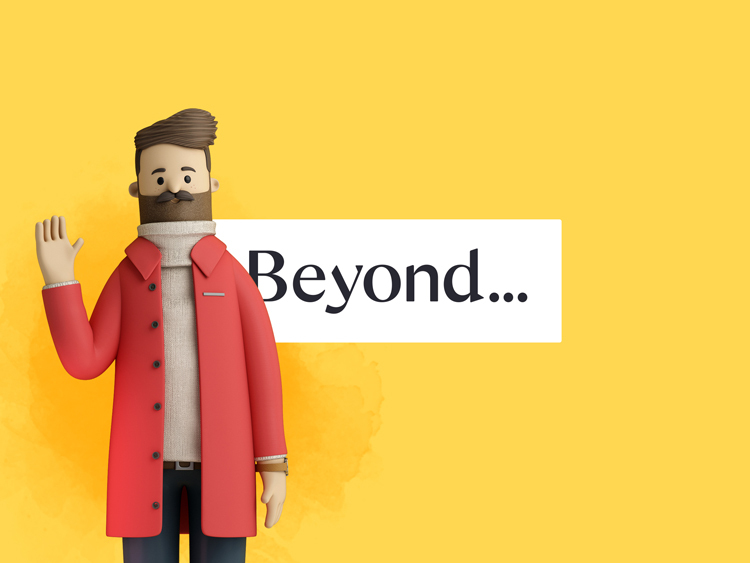 As part of the rebrand process, the funeral price comparison company has renamed itself Beyond, and commissioned SomeOne to give it a new brand identity. 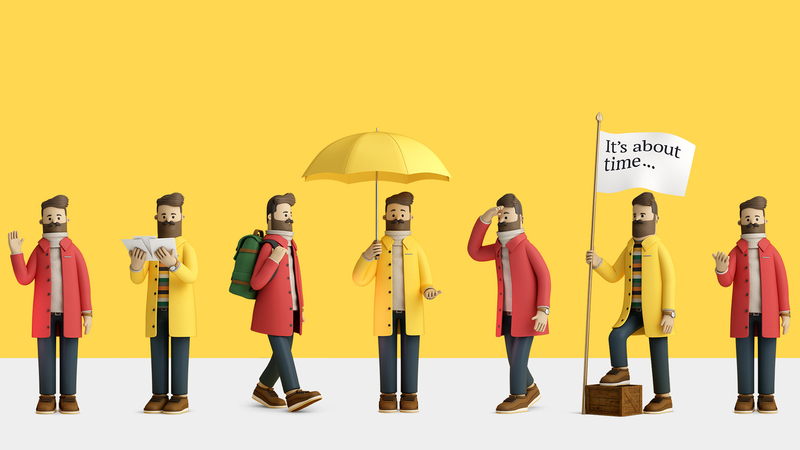 The new branding is centred around a yellow and white colour palette, a bespoke, sans-serif typeface, and an animated mascot of a bearded man. Serif typeface ParaType has been used for body copy. The new branding aims to stand out “against a sea of sameness” in the funeral sector, says Simon Manchipp, co-founder at SomeOne, of “cliché sunsets, flowers and doves”. Instead, the new mascot aims to be a “charming, respectful and friendly way to get across sensitive information”, he adds. “It’s a brand for everything after life – the great ‘beyond’,” says Manchipp. “Our research found that while no laughing matter, the businesses surrounding bereavement were lagging behind brands that operate within the everyday lives of people. “Those finding themselves in need of funeral services don’t want kid gloves – they are looking for calm, professional and useful advice, rather than an apology at the beginning of every conversation,” he adds. The mascot icon was chosen to act as a simplifier and an “intelligent guide” to help people through the hurdles of booking funeral services. “It’s easy to dismiss a mascot as a trivial choice, but mascots are proven to help people digest messaging and stories that are otherwise unpalatable,” Manchipp says. 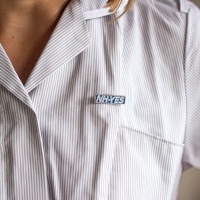 The new brand strategy also features a more relaxed tone of voice for the company, which aims to be “supportive and knowledgeable but not apologetic”, says Manchipp, which is applied to editorial copy and resources that aim to help those who are bereaved, such as explainer articles on how to plan a funeral, funeral glossaries, cost break-downs and lists of useful sites and resources. 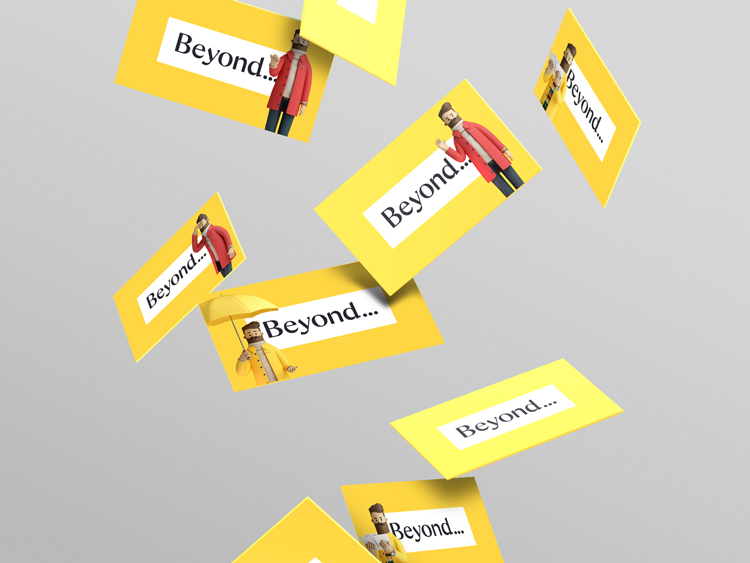 “Beyond’s new identity is a brand for the masses, and brings clarity and a touch of charm to a largely bleak and unimaginative portfolio of businesses,” says Manchipp. 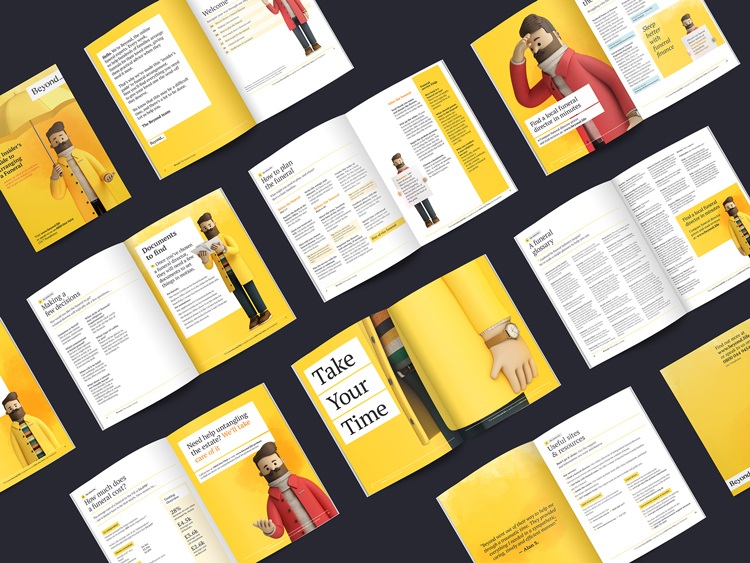 The new branding has now rolled out across Beyond’s website and app, print communications and customer magazines, business cards, and print advertising materials. Hmmm, really not sure. 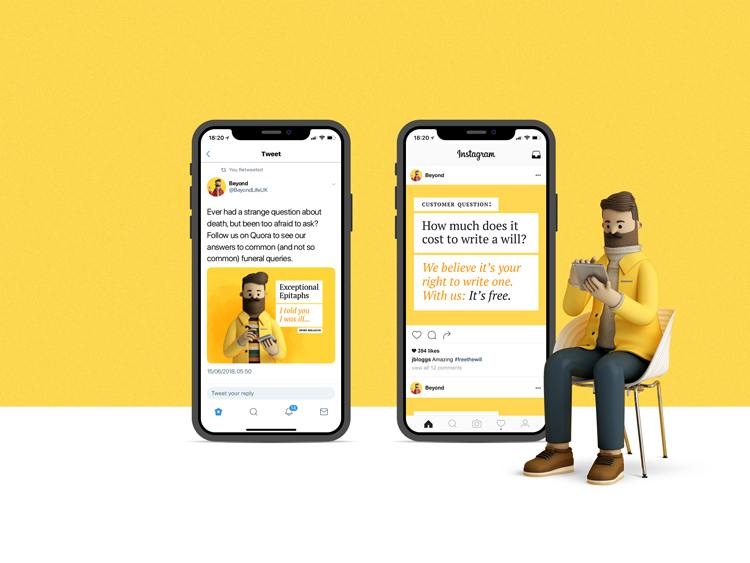 I like the colours, and agree it’s a great idea to get away from the sameness of funeral sector design, but why did they have to make him look like a fisherman? 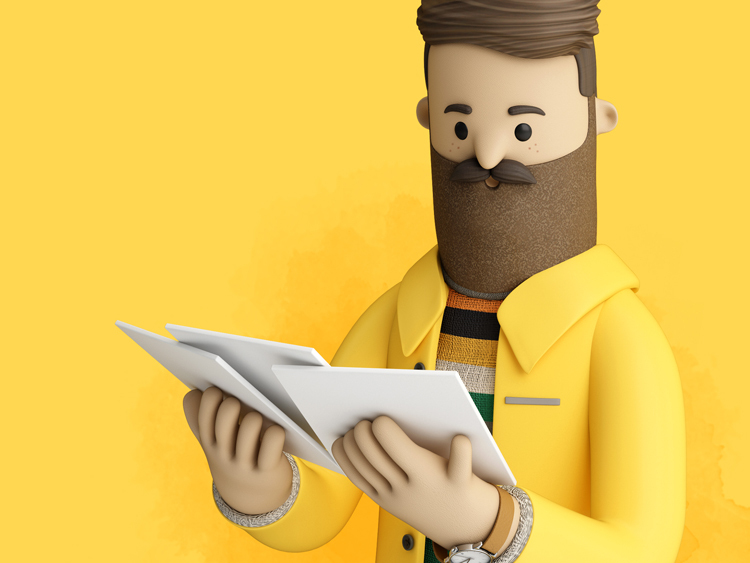 Mascot maybe, but white middle-aged man with hipster beard? Not so much. ‘Til death us do pun. Better than the grim reaper I suppose. I love this, not too sure of the cartoon man but I understand why they have done it. I love the twitter and the “I told you I was ill…” which was something my mum said when she was diagnosed with terminal cancer. Brought a smile to my face, death doesnt have to be doom and gloom and depressing.